Finding the best complements to your main dish will make for a great meal. This guide is about side dishes that go with quiche. Can anyone tell me what else you would cook with a quiche to make a meal at dinner time? Seems like a quiche alone isn't much. I need some more ideas to go with my quiche. If it's a vegetable quiche some bread is all you need. If your quiche has meat a salad would go good. Fruit is a good dessert with quiche. Quiche is very dense and filling and you really don't need much to go with it. It all depends on what kind of quiche it is but if it is a dinner quiche, I'd add a tossed salad or some sort of green veggie. Corn on the cob might be good as well. I would probably put out cottage cheese and pickled beets too and cornbread or rolls of some kind. If it is a veggie quiche and you want some meat, you could always have some cooked sausage of some sort or sliced ham. When I had quiche at a tea room sort of restaurant, I believe fresh fruit and a muffin was served with the quiche. I just love quiche....think I'll make one soon! I serve quiche for dinner quite often and my mother did as well. After reading this, I decided to do one tonight. I'm going to have a crusty bread with butter and steamed green beans. I'm also going to have some pear slices because I have a pear handy and my boys will like that better than the green beans. I'll have a little bacon and some onion, garlic and tomato in the quiche. Maybe I'll see if I have any basil left in my herb garden. I often serve a salad instead. If you really wanted a hearty meal, you could serve a soup with it instead, maybe a beef or chicken broth with some vegetables. Like other posters said, you can add just about anything to quiche to make it more filling. Leeks, broccoli, mushrooms, ham, spinach, zucchini, peppers. It is like pizza in it's versatility. For your dinner, why don't you partner your Quiche with salad, bread, a seasonal veggie, & of course, sugar sweetened tea for my Texan hubby! Salad: baby spinach, grated carrots, sprinkle with cranberries & bacon. Add your desired dressing if desired. Bread: Garlic cheese bread goes great! Tea: Boil 4-5 tea bags for ~ 10 min (Start when you begin cooking & let sit after turning off till rest of meal is ready - to steep) squeeze out tea bags & add 1 gallon cold water. Mix in 1 cup sugar. I like to add a Taco salad with my quiche. Taco bowl filled with; ground beef, cheese, guacamole, sour cream, sprinkled with deep fried bacon and if there is still some room left a few shreds of lettuce and when I'm really in a jolly mood I like to add my famous butter sauce for me and my hubby. Question: What to Serve With Quiche for Dinner? What can I serve with quiche? I want something to add to the dinner plate. We enjoy quiche pretty often for dinner. I always add some type of coffeecake, sweet quickbread, or a super easy can of cinnamon rolls popped into the oven. I am having a few people over tomorrow night for a dinner party and I am not sure what to serve with my quiche. I am planning on serving a tomato and goat cheese quiche, sided with boiled small yellow potatoes, a fresh green salad, and some nice white wine. I would like to have a soup for a starter and I am not sure if which pairs better, leek and potato (traditional Irish that my boyfriend loves!) or French onion (my personal favorite) both are not too difficult for me to make and I will serve with some type of bread. Any ideas on which might go best? Thanks! I would use a nice plain broth thst pairs well with your main dish, not something too creamy or heavy. Definitely French Onion -- no contest ........ Quiche can be very rich = and French Onion soup isn't (go light on the cheese). I would like only a cup of soup and still have a very sm. light salad with bread. I know this sounds like a lot, but make portions small. It all goes together so well. I have made myself starved. Carrot and coriander would be my choice, served with buttered crusty bread. 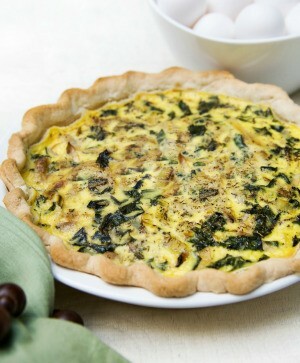 What are some good side dishes for quiche served as brunch?